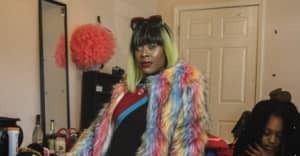 On Sunday, BbyMutha announced on Instagram Stories that she'd be taking a week-long social media hiatus to work on her debut album, entitled Christine. "I'm not dead, I'm working," she said in a brief message. In a tweet from fan account @BASTARDLOOKK retweeted by BbyMutha, further possible details about the album emerged: "she said that she’d be experimenting with mixing disco, trap and punk styles, and that the album will be conceptual & produced by SXYLK," the tweet reads. BbyMutha has release three EPs in 2018: Muthaz Day 2, BbyShoe, and Free Brittnee. Reached by email, BbyMutha added that My Friend Meesha would also produce Christine. She described the project as "a story telling album chopped up into 3 parts representing 3 different decades of music. Based loosely on the love life of bbymutha."